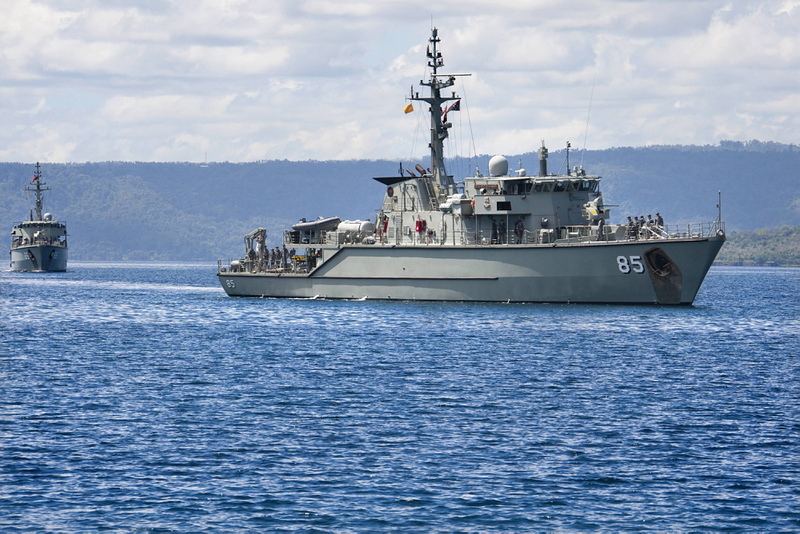 Gascoyne is the fourth of the six Huon Class Minehunters (MHC). She was launched on11 March 2000 and is based in Sydney at HMAS Waterhen. A large minehunter by world standards, the 720 tonne, 52.5 metre MHC is propelled by a V8 diesel engine driving a controllable pitch propeller in transit, and three retractable thrusters whilst minehunting. Gascoyne is the second RAN ship to carry the name, the original was Australia's first River Class anti-submarine frigate that served with distinction during World War II. In October 1944, whilst surveying for the US landings at Leyte Gulf, Gascoyne (I) experienced 39 air attacks and saw 30 Japanese aircraft destroyed. In July 1945, she provided bombardment support for the Australian troop landings in the Balikpapan area of Borneo. The Gascoyne is an area of undefined boundaries in the north west of Western Australia. The area takes its name from the Gascoyne River, Western Australia's longest river (820 km) that lays approximately 800 km north of Perth. George Grey named it in 1839 “after my friend, CAPT J. Gascoyne”. The original HMAS Gascoyne was named after this river. The Gascoyne Region is about twice the size of Tasmania and incorporates some key coastal geographic features including: Ningaloo Reef and Marine Park, Coral Bay, Cape Range National Park and the Shark Bay World Heritage Area. The region also contains Mt Augustus – the world's largest monocline. While the region’s population is only 9,700, it still attracts a number of tourists and mid-term visitors, which provide a significant input to the region’s economic base. Fishing, mining, horticulture and pastoralism also contribute to The Gascoyne Region’s economy.